THE girl, handkerchief clasped to her face, stood on the pavement waving as Frank Annable turned his lorry off the Great North Road towards Bedford. It was early morning and everything was quiet. When the girl waved him down he stopped his lorry and spoke to her. Annable, a British Road Services driver, of Tenter-close, Higham Ferrers, Northants, told the court at Stevenage, Herts, of his encounter with the girl. "She got in my cab and we drove on," he said. "I had driven some distance when she said something and I stopped at the next lay-by. She got out for a minute While she was out I noticed another B.R.S. 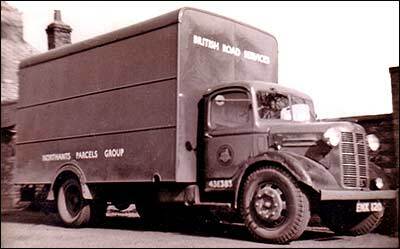 lorry, driven by my friend, Bob Daly, go by, so I flashed my headlights to signal him to stop." He reversed up to me and I had a word with him. Then I got back in my own lorry. The girl said something else to me, so I went back to my mate and he gave me some money. Then he drove off. "Finally they got me out of the cab, frog-marched me into a field and made me lie face down in a furrow. I heard my lorry being driven off. Then I was made to climb into the back of another vehicle with two men who tied me up." Annable said he was driven to London where the van was abandoned. Eventually he freed himself and called the police. The girl, the court was told, was part of the gang who planned to hi-jack the lorry with its £5,000 worth of Christmas drinks and tobacco. In the dock were Edward Charles Phillips, aged 26, of Mortimer-road, Hackney, London, and Francis Joseph Parman, aged 32, of Kilpeck House, Highbury, London. They were remanded in custody for trial at Herts Quarter Sessions accused of being concerned in the robbery. The other B.R.S driver, Robert Daly, of Pytchley-road, Rushden, Northants, said after leaving Annable with the girl he stopped and waited. He heard a long blast on the hooter of the other lorry and then saw it coming towards him. He followed the vehicle and it stopped. "Parman and Phillips came over to me and said my mate had had an accident. I denied he was my mate and they drove off. When they had gone I telephoned the police." Mr Neville Lowe, prosecuting, said that as a result of the call the police had an early start in the hunt. Parman and Phillips were detained with the lorry and its load on the outskirts of London. I have to inform you that on the 11th December 1962, a BRS lorry and its load of cigarettes and tobacco was being driven from the BRS depot at Moulesfield Road, London E.1, to the BRS depot at Bedford. During the course of the journey, on a lay-by in Hertfordshire, the driver was attacked and the lorry and its contents were stolen. 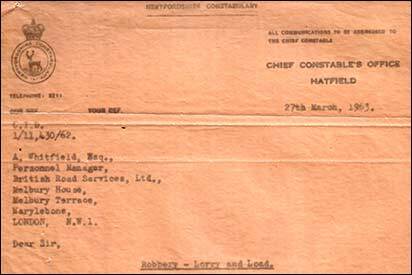 Subsequently two men appeared before Mr. Justice Marshall, H.M. Judge of Assize at Hertford, on Monday 25th March 1963, charged with aggravated robbery. They were convicted and sentenced to long terms of imprisonment. 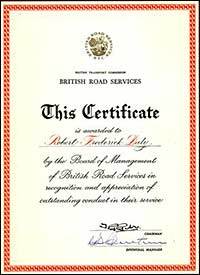 Mr Robert Daly, of 30 Pytchley Road, Rushden, Northants, who is a lorry driver employed by British Road Services, Rushden depot, rendered great service to the public in this matter. He was driving another BRS lorry in the area at the time of the crime and he knew the driver of the stolen vehicle. He noticed the other vehicle parked under circumstances which appeared suspicious to him. He had a conversation with the lorry driver’s attackers (unknown to him) which still further increased his suspicions. As a result of this he drove his own lorry and trailer to three different telephone kiosks before managing to dial 999. He subsequently positively identified the two men who appeared later at the Herts Assizes. It was directly as a result of Mr. Daly’s prompt action in dialling 999 that the lorry and its thieves were arrested some minutes later. Mr. Daly’s keen observation and his very prompt action were of the greatest possible assistance to the police, and, therefore, to the public. 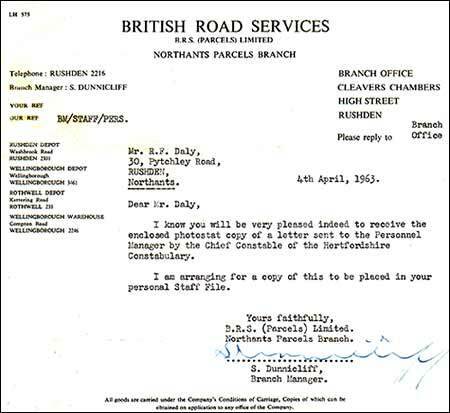 A letter from the British Road Services Board of Management in 1963 to Robert Daly. The letter head tells us that in 1963 there were three depots: at Rushden, Wellingborough, Rothwell, and a warehouse at Wellingborough.